Central State University is pleased to announce Barber as the Central State University 2019 Commencement featured speaker. Barber is a distinguished author and social justice advocate who has built a national grassroots movement that crosses race, gender, age, and class lines to address poverty, inequality, and systemic racism. He is a phenomenal orator whose work and ideas inspire and motivate the nation to the greater good. The stadium renovations will be completed this fall along with the grand opening of the new Academic/Wellness Center and a 250-bed apartment-style residence hall to accommodate current and projected increases in enrollment. Other initiatives reflecting the continued growth of the University include, the addition of new degree programs in Exercise Science, Agriculture Education, Sustainable Agriculture; the College of Business Summer Banking Institute, and most recently the introduction of the Masters of Business Administration degree program, available fall 2019. It's a day for giving thanks and giving back. We have two days for getting deals—Black Friday and Cyber Monday; and now we have Giving Tuesday, a global day dedicated to giving back. On Tuesday, November 27, 2018, charities, families, businesses, community centers, and students around the world will come together for one common purpose; to celebrate generosity and to give gifts of support. Central State University is proud to participate in #GivingTuesday 2018, a global day of giving back. This #GivingTuesday, we ask that you consider supporting one of our unique student, faculty, or program projects on Be A CSU Believer. What Is A CSU BELIEVER? This year on #GivingTuesday, Central State University will be dedicating all giving efforts to fundraising projects on Be A CSU Believer, the official crowdfunding platform for Central State University! Be A CSU Believer specifically showcases student, faculty, and/or staff fundraising projects seeking support. We have 17 CSU Believer teams that support projects from Athletics to Colleges. It is easy to participate, simply click on a team that interests you and join the group to make a difference in the area that matters most to you! On November 6, 2018, Central State University students will have an opportunity to exercise their inalienable voting right and duty which could change the civic engagement and political space of America’s democracy. Across America, there are numerous incidents of voter suppression where American citizens are fighting vigorously to vote in the upcoming election. Here, in Ohio and specifically, for you, the right to vote requires only that you do it! Central State University has co-sponsored several voter registration drives; provided voter processes and will provide transportation to the voting poll which is at Wilberforce University. Nothing will be more important in your life and for years to come then the vote that you exercise on November 6th. I encourage you to VOTE for yourself but also for those in American history who were tortured, killed and suppressed because they wanted to VOTE! I encourage you to VOTE for the thousands upon thousands of American citizens whose right to vote has been denied even today! I encourage you to VOTE in order to actualize the change that you want to see happen today and in the years to come. I encourage you to VOTE because you cannot afford to be a bystander as others decide your destiny. College students across universities are taking this election very seriously and I know that you are too! Central State University has a Civil Rights history and our commitment to social justice, human dignity and integrity, and voter registration will not be just a memory in history. We continue to look to the current warriors of justice, YOU to continue the legacy. VOTE as if your life depends on it…because it does! 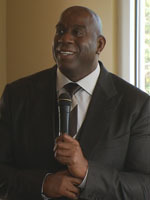 XENIA, Ohio – NBA legend and business mogul Earvin "Magic" Johnson continues to show his dedication to improving the educational opportunities for today's youth with a $1 million donation to Central State University. Speaking at CSU’s Hall of Fame Luncheon on Friday, Johnson spoke about the importance of giving back. "It is so important for our young people to move on and get a degree from a quality institution. I love making sure that they receive a quality education and go on to become successful and do great things in our society." Midway through his public address to the audience of 250 people, Johnson directly addressed CSU President Cynthia Jackson-Hammond with his donation to help provide initiatives designed to promote student success. Jahan Culbreath, vice president of Institutional Advancement for the university talked about Johnson's gift. "Magic believes in the mission of our university. His gift shows his commitment to education. We encourage others to join Magic in becoming CSU believers and invest in the future success of our students and institution." 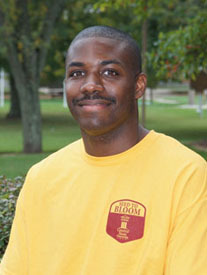 Johnson has a history of supporting and promoting Central State University. In 2008, he served as a guest speaker at CSU's Leadership Speakers Series. In 2015, he was present for the University's official opening of CSU’s University Student Center. WILBERFORCE, OH. – Over 12,000 agriculture teachers across the nation mentor, motivate, and make a difference in the lives of students each day. For the last nine years, the National Teach Ag Campaign has celebrated the contributions agriculture teachers across the United States make each day in their classrooms with National Teach Ag Day. To commemorate this year’s celebration, the Central State University School of Agricultural Education and Food Science will host a Watch Party on September 20 for any student with an interest in Agricultural Education. Designed to help address the critical shortage of Ohio agriculture teachers, CSU’s School of Agricultural Education and Food Science was established in 2016. The Agricultural Education degree programs were first offered to students in fall 2017. Central State’s Agricultural Education Program provides students with the tools needed to succeed in the teaching profession and agricultural related careers. CSU provides instruction in teaching methods, curriculum planning, leadership development and community engagement. Just recently, the school celebrated a milestone after the Ohio Association of Agricultural Educators (OAAE) named Central State University School of Agricultural Education and Food Science as the Outstanding Post-Secondary Program of 2018. “Our goal over the past 18 months has been to promote awareness of our program. We have a great opportunity to train and develop a diverse group of students,” says Jon Henry, CSU Director of Agricultural Education. “We provide an accessible and affordable option for traditional and non-traditional students to develop the skills necessary to meet the high demand in agricultural related careers.” National Teach Ag Campaign encourages everyone affiliated with agricultural education to take time to recognize the vast impact agriculture teachers make in the lives of their students. Through the development of life skills, problem solving, and leadership, agriculture teachers help students become entrepreneurs and agriculturalists who will help shape the future of agriculture across the globe. 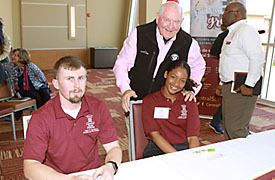 Anyone can participate in Central State’s School of Ag Ed Watch Party by visiting https://www.naae.org/teachag/webcast/index.cfm On campus, the party will start at 9 a.m. in the Joshua I. Smith Center for Education and Natural Sciences Conference Room. WILBERFORCE, OH. – Central State University has announced that its entering freshmen class enrollment continues to grow. The 2018-22 class boasts over 900 new and transfer students. Central State University strategically focuses on recruiting quality, academically prepared students. Overall increases have resulted from early outreach and cultivation of these students with focused attention on those interested in pursuing majors in science, technology, engineering, mathematics, and agriculture. The 2018 incoming class at 920 are primarily from Ohio with high numbers coming from surrounding regions. Central State University has also tripled its international enrollment since 2014. Central State has worked diligently to reduce internal costs which has allowed the University to pass savings on to their students. "The continuing increases in new student enrollment and returning upperclassmen not only indicate an appreciation for the University's efforts to reduce costs, but also the quality of our academic programs and the overall collegiate experience", said Vice President for Student Affairs and Enrollment Management, Dr. B. Sherrance Russell. Central State lowered its cost for out of state students by 70% in 2015 and established initiatives to support affordability options for all students. According to U.S. News & World Report, Central State University is the 3rd Most Affordable four-year public institution in the country. Among Ohio’s 14 public universities, Central State is ranked as the most affordable. The surge in student enrollment has led to an increased demand for on-campus housing. Central State University is expanding its housing offerings and is in construction of a 250 bed apartment style residence hall that will be home to a state of the art wellness center and also house the new exercise science program. "Our campus is growing and we are investing in residence options that support our students' connection to the campus and amenities," said Vice President for Administration and Finance & CFO Curtis Pettis. The new residence hall will open in fall 2019. Other factors contributing to the University's growth – Central State is celebrating three years of academic achievements including new academic degree programs in exercise science, agricultural education, and sustainable agriculture. Recently, the University's College of Business Banking Institute Program was just recognized as the top business school program of 2018 by HBCU Digest. Also, Central State University's School of Agricultural Education and Food Science was named the Outstanding Post-Secondary Program of 2018 by the Ohio Association of Agricultural Educators. "This is an exciting time for CSU," said Central State President Cynthia Jackson-Hammond. "We are growing in many positive ways, including development of broader degree partnerships, international collaborations, and research with global-impact." "Central State University students and families recognize the tremendous value of higher education and especially the value of a degree from CSU," said Jackson-Hammond. "The return on investment for their time and experience as a Central State University graduate will yield great success in their career options." WILBERFORCE, OH. – Ohio Governor John Kasich has appointed a Dayton-area non-profit executive to the Central State University Board of Trustees. Yonathan M. Kebede, Vice President of Operations at Fidelity Health Care, a community/home-base services provider for Premier Health of Dayton, Ohio was appointed to a nine-year term ending in 2027. He will fill a vacant position on the board. His appointment brings the number of trustees to eight plus one newly appointed student trustee Ms. Roshay Timmons. Yonathan Kebede has served as the Director of Service Integration at Premier Health. During Mr. Kebede’s time with Premier, his responsibilities extended through six institutes: Women’s Health and Emergency and Trauma services, Sports Medicine, Orthopedics, and Cardiovascular. Prior to that, Mr. Kebede’s past experiences included Healthcare consulting, Innovation Projects Management, Process Improvement, Nursing operations management, and physician alignment strategies. Within the community, Mr. Kebede serves as the Chair of the Logistics Committee on the Dayton’s African American Wellness Walk, and Chair of the Health and Social Services on the Welcome Dayton Committee for City of Dayton. Central State University was recognized for its strong academic and athletic prowess at the annual HBCU Digest awards as the College of Business earned the distincition of Best Business Program of 2018 while hurdler Juan Scott took home Male Athlete of the Year honors. Renowned for its training and job placement of Central State students, CSU’s College of Business has instituted a wide variety of programs which includes the Ohio Summer Banking Institute. In partnership with Union Savings Banks and the Ohio Bankers League, the 10-week summer internship program trains and places Central State students in banks around the region. Juan Scott, a hurdler from Dayton, Ohio, was undefeated in the indoor 60-meter hurdles this past season, culminating with an NCAA Div. II national title in March. In the outdoor season, Scott tallied three victories, finished sixth at nationals in the 110-meter hurdles and earned All-American honors. HBCU Digest is a national publication dedicated to covering Historically Black Colleges and Universities. The 2018 HBCU Digest Awards were held at the Renaissance Harborplace Hotel in Baltimore, Maryland. Central State University has announced Dr. B. Sherrance Russell as its new Vice President for Student Affairs and Enrollment Management. Dr. Russell will be responsible for expanding and improving the student profile of the University. This includes continuing to improve the processes of enrollment management, student recruiting, selectivity, class quality, and admitting students who are most likely to thrive at CSU. He will also develop an enrollment marketing plan and a new retention plan. “I am excited to have Dr. Russell join the Central State University team. I am confident that he will work to develop and implement strategic enrollment and retention practices,” says Dr. Cynthia Jackson-Hammond, President of Central State University. 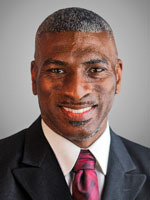 Raised in Austin, Texas, Dr. Russell received a Bachelor of Business Administration degree in General Business, with a focus on Management at Texas Southern University in 1993. 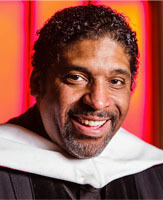 He received a Master of Education degree, with a focus on Urban Education from Langston University in 1999. He is a 2006 graduate of the Urban Higher Education Executive Ph.D. Program at Jackson State University where he was a member of the inaugural cohort. Dr. Russell is a seasoned higher education professional and has over 25 years of experience in higher education. Dr. Russell previously served as Senior Residence Life Officer at Prairie View A&M University, a position he has held since 2014. From 2010 to 2014, Dr. Russell was the Dean of Enrollment Management and Vice President of Enrollment Management at Huston-Tillotson University where he launched the new Adult Degree Program for working adults. While at Langston University from 1996 to 2006, he served in several capacities including Associate Director of Enrollment Management. Over the course of his career, Dr. Russell has managed more than 10,000 beds in student housing at various colleges and universities. Dr. Russell is a member of Alpha Phi Alpha Fraternity, Inc. and served as Chief of Staff for the 22nd Southwestern Regional Vice President. In addition, he received his license in ministry in January 1999 and was ordained by the Christian Methodist Episcopal Church. Dr. Russell will assume his new role at Central State University on July 1. Columbus, Ohio — Central State University was recently included in an economic impact study conducted for the Inter-University Council of Ohio (IUC) indicating that the state’s public universities, their students, and regional alumni added $42 billion in income to the state economy in 2016-17. The $42 billion figure represents about 6.7 percent of Ohio’s total gross state product. The universities’ $42 billion of economic impact supported 558,841 jobs in 2016-17. That means one of every 12 jobs in Ohio is supported by the activities of universities and their students. The benefits to students are reflected largely in increased earnings over a lifetime. Benefits to taxpayers consist primarily of taxes paid to state government and used to benefit the state. Taxpayers realize additional benefits in the form of reduced costs incurred by the state to pay for healthcare, crime, and unemployment. For additional information about benefits provided by Ohio public universities, please visit - https://forwardohio.org/. Data and assumptions used in the study are based on several sources, including the FY 2016-17 academic and financial reports from the public universities of Ohio, industry and employment data from the U.S. Bureau of Labor Statistics and U.S. Census Bureau, outputs of Emsi’s Multi-Regional Social Accounting Matrix model, and a variety of studies and surveys relating education to social behavior. The study applies a conservative methodology and follows standard practice using only the most recognized indicators of investment effectiveness and economic impact. For a full description of the data and approach used in the study, please contact IUC for a copy of the full report. Emsi is a leading provider of economic impact studies and labor market data to educational institutions, workforce planners, and regional developers in the United States and internationally. Since 2000, Emsi has completed more than 1,80 economic impact studies for educational institutions in four countries. Visit www.economicmodeling.co for more information about Emsi’s products and services. The Ohio Association of Agricultural Educators (OAAE) has named Central State University’s School of Agricultural Education and Food Science as the Outstanding Post-Secondary Program of 2018. “We are continuing to build Central State University’s reputation as a great destination for students interested in agricultural education. The recognition by the OAAE signifies that we have successfully established the credibility of our program with the agricultural education professionals in the state of Ohio,’ says Jon Henry, CSU Director of Agricultural Education. Designed to help address the critical shortage of Ohio agriculture teachers, CSU’s School of Agricultural Education and Food Science was established in 2016. The Agricultural Education degree programs were first offered to students last fall. CSU’s Agricultural Education Program provides students with the tools needed to succeed in the teaching profession and related careers. CSU provides instruction in teaching methods, curriculum planning, leadership development and community engagement. Students also gain hands-on experience in an off-campus, 12-week student teaching experience in a high school agricultural education program. Multidisciplinary coursework also includes agribusiness, animal science, horticulture, soils, agricultural machines, grain crops and natural resources. CSU will be recognized at the 2018 OAAE Awards Luncheon on Wednesday, June 13 at the Ohio 4-H Center in Columbus. In addition, CSU also qualifies for consideration as the National Association of Agricultural Educators (NAAE). The OAAE is recognized by students, agricultural educators, and stakeholders as proactive leaders in Agricultural Education. The OAAE is committed to positively impacting, promoting, and developing professional interests of agricultural educators for the benefit of our students. Central State University has been nationally recognized for excellence by earning final consideration in five award categories by HBCU Digest. Finalists were selected from a field consisting of 700 nominations from across the country. The University is once again in the running for HBCU of the Year. Earning 2017 HBCU of the Year recognition, Central State hopes to become the first institution to be named HBCU of the Year in consecutive years. The recipient of the HBCU Female President of the Year award in 2016, CSU President Cynthia Jackson-Hammond returns for the 2018 edition seeking to become the first two-time winner of the individual award. Presidents and University finalists have been selected by HBCU Digest based on the level of outstanding leadership, academic success rate, collaboration between the administration, faculty and staff and the overall progression of the institution. Renowned for its training and job placement of Central State students in banks around the region, CSU’s Ohio Summer Banking Institute is nominated in the category of Best Business Program. Professor Jeremy Winston is a finalist for Male Faculty Member of the Year. In March, Winston was presented the Black History Month Congressional Award for Community Service from Ohio Congressman Mike Turner. Winston, who directs the CSU Chorus, earned the state-level recognition by being a positive contributor to his community while molding the next generation of music professionals and creating music at a world-class level. Juan Scott, a sophomore hurdler, is a finalist for Male Athlete of the Year. Scott was undefeated in the indoor 60 meter hurdles this season, culminating with a NCAA Div. II national title in March. In the outdoor season, Scott tallied three victories, finished sixth at nationals in the 110 meter hurdles and earned All-American honors. For details on discounted hotel rates, visit Passkey.com's Site. WILBERFORCE, OH - A unique Central State University career-development program for Ohio’s banking industry has received a significant endorsement from Ohio’s leading trade association for banks and thrifts. The Summer Banking Institute 2018, which started as a partnership between Central State and Union Savings Bank, now has a third partner - the Ohio Bankers League, which represents 230 banks in Ohio. The 10-week summer internship program, which trains and then places Central State students in banks around the region, now offers more bank placements and year-round employment. On Monday, this year’s program began with 23 students, which is a little more than double the number of participants from last year. After four weeks in the classroom, the students will complete a six-week internship at one of seven participating banks around Southwest Ohio. In the classroom, students are exposed to different functions of the bank such as Marketing, Accounting, Mortgage Lending, Commercial Lending, and Retail Banking among other topics. Upon completion of the program, they are awarded college internship credit plus a certificate in Universal Banking. Beck said, "Union Savings Bank & Guardian Savings Bank are excited about the Ohio Bankers League's support of the Central State University 2018 Summer Banking Institute. We approached OBL about this collaboration because it allows more students to experience working in the banking industry and it has the potential to lead to increased diversity. Our vision is that the CSU College of Business becomes the institution for the best banking talent in the state of Ohio." Adelman said this program makes sense for his membership because roughly half of Ohio Bankers League members are small community banks with $100 million in assets or smaller. But banks are an important lifeblood for a community. “Show me a town that has a good strong bank and that is a healthy community,” Adelman said. Of the nine participants last year, seven were hired permanently to work at various Union Savings Bank locations. Sharonda McDaniel, a senior accounting major, said she had not considered a banking career before her participation in the Summer Banking Institute last year. Today, she works part-time in the Union Savings Xenia branch. “I learned so much about credit, interest rates, the federal reserve. The four weeks in class were the best part. If we had just jumped into the industry, I would have been lost,” McDaniel said. WILBERFORCE, OH – Central State University, one of Ohio’s 14 institutions of higher education, is working collaboratively with public and private sectors to provide quality educational opportunities that support workforce development. “Higher education degree attainment is the catalyst for innovation, creativity, economic security and sustaining an informed citizenry,’’ said Dr. Cynthia Jackson-Hammond, president of Central State University. Central State joins other sister public institutions in a collaborative effort, launched today, called Forward Ohioto mobilize energies in ensuring higher education is a public policy imperative for state government. “Central State University believes that the Ohio ‘talent gap,’ is of concern but can be mitigated by providing an outstanding education for students in order to strengthen the workforce,” Dr. Jackson-Hammond said. Studies indicate that about 66 percent of jobs in Ohio in 2025 will require postsecondary certificates or above. Currently, just 44 percent of working-age Ohioans have these credentials. Given the fact that Ohio public universities produce the majority of skilled workers in the state, maintaining a strong system of public higher education is essential to closing this gap and meeting the economic and workforce needs of our business community. Central State’s new agricultural education degree, designed to address a critical shortage of Ohio ag teachers, is an example of new degrees the University is offering to meet Ohio’s needs. The Summer Banking Institute, which trains CSU students for jobs in Ohio’s banking industry, is an exemplary public-private partnership that will yield dividends for Ohio’s workforce. As Ohio’s most affordable four-year institution, the quality and value Central State provides to all students is an indication of CSU’s commitment to provide access to Ohio citizens. All of Ohio’s public universities stand united in our quest to educate and graduate students so they are better prepared for thriving careers in Ohio. Forward Ohio’s information portal at http://forwardohio.org/illustrates how all of Ohio’s public universities are addressing the attainment gap and providing significant value to the state. It also provides evidence on the critical need for more skilled workers and how enhanced state investment and policy reforms can further assist public universities in closing the attainment gap. According to a recent poll, 85 percent of Ohioans agree that a four-year degree from a public university in Ohio prepares students for a good job in today’s economy. 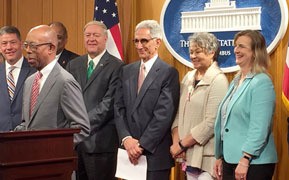 “I encourage Ohio citizens to stand with me and my fellow public university presidents as advocates for a strong and productive system of public higher education in Ohio, for the benefit of our students, our economy and our state,” said Dr. Jackson-Hammond. Washington, D.C. – The Thurgood Marshall College Fund (TMCF) Board Chairman Jim Clifton announced the addition of Dr. Cynthia Jackson-Hammond, President, Central State University, to the TMCF Board of Directors. Recognizing the importance of having more HBCU subject matter experts to help lead the 31-year-old organization into the future, the decision was made to identify leaders from the HBCU community at large to bring the expertise and first-hand perspective to TMCF’s diverse Board of Directors. Dr. Kent J. Smith, Jr., President, Langston University, was also appointed to the TMCF board. “Our board is proud to have Dr. Hammond and Dr. Smith join the TMCF family because we know they appreciate the work we do as an organization and will work to find ways to make TMCF an even better partner in advocacy, scholarships and capacity building for our 47 member-schools,” said Jim Clifton, TMCF board Chair and Chairman and CEO of Gallup. Dr. Jackson-Hammond is the eighth president of Central State University where she is recognized as an innovative leader expanding course offerings and infrastructure for the students. She earned a Doctorate of Higher Education from Grambling State University, an Education Specialist degree in counseling education and a Master’s degree in communications from the University of Louisiana-Monroe, and a Bachelor’s degree from Grambling State University in English and communications. Hammond was recently awarded HBCU Digest’s Female President of the Year for her bold leadership. Established in 1987, the Thurgood Marshall College Fund (TMCF) is the nation’s largest organization exclusively representing the Black College Community. TMCF member-schools include publicly-supported Historically Black Colleges and Universities (HBCUs) and Predominantly Black Institutions (PBIs). Publicly-supported HBCUs enroll over 80% of all students attending HBCUs. Through scholarships, capacity building and research initiatives, innovative programs, and strategic partnerships, TMCF is a vital resource in the K-12 and higher education spaces. The organization is also a source for top employers seeking top talent for competitive internships and good jobs. WILBERFORCE, OH. – Central State University took another solid step into the future after breaking ground for a $24M Residential/Academic/Wellness Center. Students were introduced to the next generation of campus living- a complex where students can live, focus on exercise and wellness, and take classes. The apartment-like facility, which will be the first of its kind on campus, offers new choices for students starting August, 2019. About 80 people, including students, alumni, city officials and faculty and staff, attended the April 27 ceremony. Kristin Johnson, president of the Student Government Association, asked all the students to stand during the ceremony. “We are about to…do something exciting for this University,” she said. The complex is being built by University Housing Solutions, a Columbus-based student housing development company. A long-time business collaborator with the University, UHS built the Harry G. Johns Living Learning Center and John R. Fox Hall in 2011. In addition, last fall UHS donated in-kind services close to $1M to help revitalize Williamson Hall, another residence hall on campus. James Schmidt, president of UHS, said the company is excited to be able to partner with Central State again and to be a part of this new residential project. UHS will own the facility and lease it back to the University. The 250-bed facility will feature studio, one-, two- and four-bedroom apartments, along with a state-of-the-art health and wellness center, a health café and an outdoor activity space. WILBERFORCE, OH. – More than $50,000 in scholarships were awarded to Central State University students pursuing Manufacturing Engineering or Environmental Engineering degrees as a part of program to develop a highly qualified agriculture/engineering applicant pool. Central State, part of the Ohio Land-Grant system, presented scholarships to 33 students on Tuesday, April 24, in a ceremony held on campus. The scholarships represent excellence in engineering and the promise of greatness in the students. The students ranged from sophomore to seniors. “Through my hard work and perseverance I appreciate being recognized for my achievements,” said Bobby Gist, a junior majoring in manufacturing engineering. The funding is part of a $2M grant from the U.S. Department of Agriculture, Natural Resources Conservation Service to support the development of a diverse student agriculture/engineering applicant pool for NRCS and the United States Department of Agriculture. The departments support the integration of disciplines that apply engineering science and technology to agricultural production, conservation, and processing. Scholarships for undergraduate students engaged in agriculture/engineering science disciplines. Pre-College outreach pipeline programs to support the goal of producing students with integrated knowledge and experience. Participation of students, faculty, and staff at conferences and experiential learning events that support the agricultural sustainability, natural resources conversation, and agricultural production. The selection of the Presidential scholars generally is made on a minimum cumulative GPA of 3.0 and above. Close to one-third of the scholars are female. WILBERFORCE, OH. – Central State University will build its first apartment-style residence hall to give students more on-campus housing options. The complex, which will feature studio, one-, two- and four-bedroom apartments, will also feature a state-of-the-art health and wellness center, a wellness plaza and an outdoor activity space. The amenities will provide new housing solutions for students who want to stay on campus to live, learn and grow. The 250-bed facility will be located behind McPherson Stadium and will create an anchor and public face on the east part of the campus. It will be the largest single residential facility to date. The most recent dorms added were the Harry Johns Living Learning Center and Fox Hall, both built in 2011. “Our campus is growing and we are glad to make this investment for our students so that students can have different living options that keep them connected to the campus and other campus amenities, said Curtis Pettis, Vice President for Administration and Finance & CFO. Currently 1,221 CSU students, or 70 percent of enrolled students, live in University housing. The University is leasing apartment-style spaces from Payne Theological Seminary and the Greene Meadows Apartment complex for 30 juniors and seniors. The planned health & wellness center will include two classrooms that can be used as additional academic space for the University’s Exercise Science major and rooms for exercise classes. A Health café, where food and beverages will be sold, will be located there. The new complex will be built by University Housing Solutions (UHS), which specializes in developing living/learning communities on university campuses. According to UHS, the Ohio-based company has planned, designed and built more than 2,500 beds within the past six years. UHS was the contractor that built the Harry Johns Living Learning Center and Fox Hall. Cost of the project is $24M. UHS will own the residence hall and lease it back to the University. A groundbreaking ceremony will be held on Friday, April 27. WILBERFORCE, OH - Central State University, Ohio’s 1890 Land-Grant Institution, will assist Montgomery County officials in continuing its mission to supply high quality water 24/7 to the region. The University is entering into a two-year memorandum of understanding with Montgomery County to collaborate on the development of a Smart Water Distribution and Wastewater Collection model across the Montgomery County System. The $400,000 deal between Montgomery County and Central State includes a $200,000 match from the University. 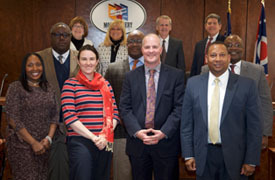 On Tuesday, April 10, Montgomery County Commissioners approved the resolution for the MOU. The partnership will also promote projects, initiatives, and collaborations that focus on Water Resource Management, Health/Food/Exercise, Workforce Development and Advanced Agricultural Technologies. The University will utilize the expertise of its International Center for Water Resources Management, which has addressed both global and statewide water quality challenges. The Center was the first of its kind in Ohio and among all Historically Black Colleges and Universities (HBCUs). “Central State is committed to collaborating with municipalities to share best practices and opportunities that will enrich the student experience and drive research and economic initiatives for communities,” said Dr. Alton Johnson, Dean, College of Engineering, Science, Technology, and Agriculture and Director, 1890 Land-Grant Programs. “We are excited our University will play a key role in Montgomery County’s water distribution strategies as we increasingly institutionalize both our research and our economic development mandates.” University and research collaboration is a critical part of the Land-Grant mission. Late last year, Central State entered into a partnership with the City of Trotwood to provide agricultural research and Extension activities. This new agreement will enable both organizations to promote further dialogue and coordination in the areas of research in agricultural, food sciences, and water resources for students and researchers. The MOU is through April 30, 2020. April 6, 2018 - WILBERFORCE, OHIO - Dr. Loretta J. Mester, President and Chief Executive Officer of the Federal Reserve Bank of Cleveland, delivered a pragmatic and yet visionary message at Central State University focused on the necessity of inclusiveness in the field of Economics. 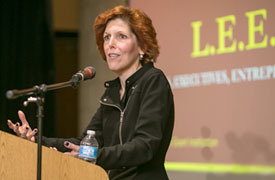 "I like to think of economics as a social science that helps us think about how people use scarce resources," Dr. Mester said during her keynote address on April 4 at the L.E.E.D. Conference, hosted by the College of Business. L.E.E.D., which stands for Leaders, Executives, Entrepreneurs and Directors, is a two-day annual event focused on providing a networking opportunity for business majors to share substantive practical knowledge in planning, teamwork and decision-making. Dr. Mester's speech was filled with facts, figures and statistics. But she also shared anecdotes from her own life with more than 250 students, business leaders and industry attendees. She said she 'lucked' into the field through the recommendation from two Princeton professors who thought she could use her math degree to gain a leg-up in the Ph.D. program at Princeton University. "It has provided me with a fascinating career, and I hope that at least in a small way I’ve been able to provide some good in return through economic research and policymaking," Dr. Mester said. "Economics has many real-world applications," she stated. "It can help us understand the issues facing people in or entering the workforce and provide evidence on which programs are most effective at helping them finance their education, develop new skills, and manage the changing job landscape driven by technological innovation." Dr. Mester was emphatic in her message that a more diverse Federal Reserve makes better policy. "I have seen firsthand how having a diversity of views expressed and discussed around the table can actually lead to better policy decisions, and there is actual research to back this up," said Dr. Mester. “When a more diverse group is at the table making policy, she said, it helps avoid "group-think." Today only about a third of women are choosing to major in economics as compared to their male counterparts, while the rate for minorities is about half that of white students, she said. But not only is the field of economics missing out on the diversity of thought, ideas and solutions, but minority students are losing out on a degree that provides lucrative career opportunities immediately upon graduation. One recent study found that those with a bachelor's degree in economics earn about 20 percent more than graduates with degrees in other fields. Some of the salary differences reflect the fact that economics majors have access to a wide variety of occupations, many of which are higher-paying. Dr. Fidelis Ikem, Dean of the College of Business, understands the opportunities for students studying economics. The College is working to develop a concentration in agricultural economics to meet the increasing demands for this field in Ohio. "We think this program will go hand-in-hand with our agribusiness program," said Dr. Ikem. "Our students love challenges and this will be a great challenge and complement to their business degree." Remi Lambirth, a sophomore sustainable agriculture major, asked about the current trade dispute with China. Secretary Perdue said he had spoken to President Donald Trump and President Trump told him, "Sonny I want you to assure our farmers out there that we will not let them be the victim of a trade dispute." Frederick Hayes, Jr., a senior who is also Mr. CSU, said after leading a tour of campus for Secretary Perdue, "He actually seemed like a very down-to-earth person." “It’s been a pleasure having him here," Hayes said. "I hope he gained a lot of insight into the University." WILBERFORCE, OH - LEED is an annual program presented by the Central State University College of Business to promote a networking environment for the students. Leaders, Executives, Entrepreneurs, and Directors convey their practical and substantive knowledge with the schools most prized assets, our students. 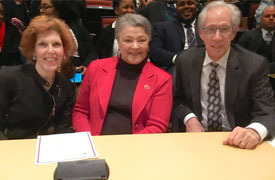 The photo is of LEED Keynote Speaker Dr. Loretta Mester, Central State University President Cynthia Jackson-Hammond and Union Savings Bank CEO Louis Beck in Wilberforce, Ohio at the April 4, 2018 event. WILBERFORCE, OH - More than 325 Central State University students will be recognized for outstanding academic achievement during the University’s Annual Honors Day Convocation on Tuesday, April 3, 2018. The event, which begins at 10 am, will take place in the Paul Robeson Cultural & Performing Arts Center. The public is invited to attend. This year’s class of honors students in the largest in the past two years. High achieving seniors receive special Gold Cord Honors. The person in each class with the highest GPA is recognized as a Top Scholar. Ms. Diouf, the Junior Class Scholar, has been the top scholar of her class for the past two consecutive years. Mr. Wagenaar, the Sophomore Class Scholar, is a College Credit Plus student attending Central State. WILBERFORCE, OH. – Two Central State University students received youth leadership awards from the Charles Young Buffalo Soldiers National Monument for spearheading a letter-writing campaign in support of recognition for Colonel Young. The Sequoia & Kings Canyon National Park may be 2,300 miles away in California’s southern Sierra Nevada mountains, but the impact that Colonel Young made there in the summer of 1903 is still being remembered today. A California Assemblyman is sponsoring an effort to rename a road leading into the park for Colonel Young, the namesake of the National Monument located in Wilberforce. Through the efforts of Kristin Johnson and Sydney Johnson, more than 180 letters were written and sent in support of that effort. On March 15, the two students received the Brandon Billips Youth Service Leadership Award, named after Billips, who was a CSU graduate and the first intern at the Charles Young Monument. The event was a celebration of Colonel Young’s 154th birthday. Also, Attorney Benjamin L. Crump received one of two Trail Blazer Awards. Dr. Joy G. Kinard, Superintendent of the Charles Young Buffalo Soldiers National Monument, said the two sisters received the honor because their volunteer-efforts exceeded expectations. Both work at the Charles Young Monument. After hearing about the campaign, the two built a strategy to solicit as many letters as possible. Sydney Johnson, a CSU Junior, said it was fun “creating a small piece of history.” More than half of the 180 letters came from CSU students and employees, she said. Colonel Young was the first African American superintendent of a national park. He also was the third African American man to graduate with his commission from the US Military Academy at West Point. While commanding a black company at the Presidio of San Francisco, Young received orders to take his troops to Sequoia National Park. Their task - complete the first road to the Giant Forest, making the grove with giant sequoia trees easily accessible for the first time. On the day the road opened, modern tourism began in Sequoia National Park, according to the Park. Sydney Johnson said it was an honor to receive the award. “I was more humbled by the award not because of the task I was given..but because I was given an award named after Brandon Billips. He created such a love for me of Central State University,” she said. Also at the March 15 event, the University’s Student Government Association was named Volunteer of the Year for helping to recruit student volunteers for the National Monument, and Mr. Gorgui Ndao was named Volunteer Educator of the Year for his work with the Seed to Bloom Ag-STEM Institute Camp. Cadets from CSU’s Marauder Battalion were also recognized for helping out at a Buffalo Soldiers Pep Rally during Black History Month. GERMANTOWN, OH. 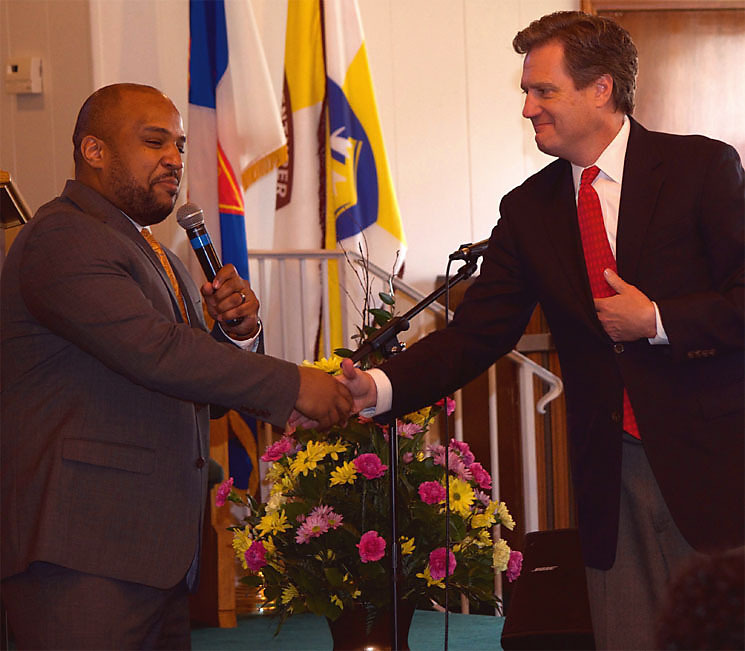 - This weekend, Congressman Mike Turner (OH-10) presented the Black History Month Congressional Award for Community Service to Central State University Professor Jeremy Winston. 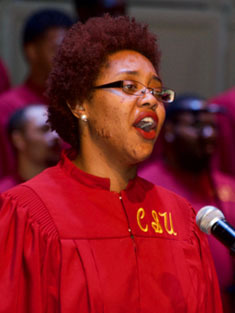 Winston joined Central State University in 2013 and assumed leadership of the world-renowned CSU Chorus to continue its legacy of excellence in choral music. The 45-member choir has performed at the White House and abroad at the Vatican, throughout China and across Europe, where they performed for sold-out audiences including in Prague, Czech Republic with the Czech National Symphony Orchestra. For 131 years, Central State University has stood as a bright shining light of hope for thousands of students. During Tuesday’s Charter Day Convocation, Speaker Cook County Commissioner Richard R. Boykin challenged more than 700 people to use that light to set the world on fire. At the Charter Day Convocation, Central State paused to reflect on over a century of academic excellence and on molding students into productive professionals. Faculty, staff, students, alumni and members of the community celebrated the University’s rich history and future vision. “This is a place where you can develop things you never dreamed of,” said 2018 Alumni Achievement Hall of Fame Inductee William H. Wiley. Mr. Gonzalo J. Rodriguez, Sr., deceased, Class of 1952. He was faculty manager where he successfully operated and managed the Central State University Bookstore for 26 years. Mr. Rodriguez became affectionately known as “Mr. Bookstore." Mr. David A. Lister, deceased, Class of 1962. He supported his alma mater on many levels throughout the years. His legacy and inspiration led to three subsequent generations of family members to follow his path by attending and graduating from Central State. Mr. William H. Wiley, Richton Park, IL., Class of 1963. Mr. Wiley has been involved with the Central State Chicago Alumni Chapter for almost 50 years. He has been instrumental in leading a class that has exhibited for 54 years a sense of giving back to Central State. The class of 1963, under his leadership, has raised more money during the classes in reunion campaign than any other class. Colonel Brad M. Beasley, Atlanta, GA., Class of 1973. After completing his studies at CSU, Colonel Beasley served as a U.S. Army Officer for more than 25 years. He is Airborne and Ranger qualified and attended the United States Army Command and General Staff College and the United States Army War College. During his Army career, he commanded at the Company, Battalion and Brigade levels of leadership. Ms. Deborah Perkins, Chicago, IL., Class of 1973. 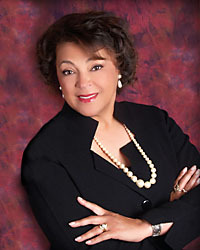 A Central State University Foundation Trustee, Ms. Perkins is the past president of the Chicago Alumni Chapter. During her tenure as president from 1997 to 2004, membership grew from 15 paid members to more than 200 paid members. She has recruited more than 500 students to attend Central State. She not only has recruited them, she has assisted them in getting financial assistance to complete their years at Central State University. Ms. Marcella A. Sampson, Huber Heights, OH., Class of 1974. Ms. Sampson, who has worked for every CSU president, except President Cynthia Jackson-Hammond, has held numerous positions at the University, but was best known as the Director of the Career Services Center and the Dean of Students. Ms. Lisa M. Peterson, Springfield, OH., Class of 1987. Ms. Peterson is a distinguished educational administrator, who is the Principal of Cox Elementary in the Xenia Community Schools district. Her support of Central State’s student teachers is strong. Students seeking onsite practices are welcomed into her building and are provided a global experience to practice and develop their teaching skills in a classroom setting. “’Let us collectively have the will to move Central State to heights unknown,” President Jackson-Hammond said. WILBERFORCE, OH – Central State University is taking several crucial steps to upgrade its safety and security systems on campus by adding lighting, security cameras and a new emergency alert system. Approximately $2M is being spent, with the largest investment going toward the installation of 460 new, state-of-the-art, high-definition video security cameras. These cameras are in addition to the 60-plus cameras already installed at the new University Student Center in October 2015. The video cameras have been placed in strategic locations around campus to monitor parking areas, residence halls, stairwells, academic buildings, corridors, and other high circulation areas. Many cameras are concealed, thus increasing the ability to monitor activity on campus. Video taken by the surveillance cameras is DVR recorded and available to law enforcement and campus safety personnel at all times. The video quality in some areas is able to show vehicle license plate numbers and facial recognition. In addition, exterior lighting upgrades have been completed. Charles Shahid, chief government officer for the University, said, “This video system gives us surveillance of critical gathering places, parking lots and common areas in residence hall, and gives the Office of Public Safety points of view to react quickly to ensure student and staff safety.” Newly installed data and fiber systems, paid for with another $3M, help to connect all campus buildings. A new 10GB fiber-optic backbone allows for the high-speed transfer of data and video across the new University network. Central State has chosen Alertus, an emergency mass notification system, for its campus-wide alert system. Alertus sends immediate text messages to students, faculty and staff, and to audio/visual beacons that will be installed indoors and outdoors around campus. The beacons will sound alarms and give verbal instructions to persons to seek shelter in an emergency. The system also will "take over" video monitors in buildings, and computers in computer labs to provide emergency response notifications once the system is activated by emergency response buttons at campus police operations center or the City of Xenia 911 dispatch center, which covers the campus at present. Other universities that use Alertus include Ohio State University, Michigan State University and University of Virginia. The video camera project will be completed in March. The Alertus System will be implemented Fall, 2018. WILBERFORCE, OH – The 2018 Central State University Theatre Arts Program will feature two new works, one written and directed by a CSU alum, and the second one highlighting the works of Stevie Wonder. The Drowning, written and directed by CSU Alumnus Ethan Stewart, will be performed on March 9-10. The Drowning chronicles the experience of young African-Americans as they transition from secondary school to a university educational experience. The play, performed by CSU students, unfolds from dilemma to success as the characters adjust and then prosper in the face of new surroundings and challenges. Stewart, who is a native of Cleveland, graduated in 2016. He currently resides in Fairborn, Ohio. Innervisions is a theatre production based on Stevie Wonder’s 1973 album of the same name. The play contains many of Stevie Wonder’s most popular songs including “Living For The City,” “Higher Ground,” “Don’t You Worry ’Bout A Thing,” and “He’s Misstra Know It All.” It uses the songs of the album as both a soundtrack for dance and an inspiration for playwriting. Students from CSU have written speeches that accompany the music and dancing that reflect on the meaning of Stevie Wonder’s songs within a contemporary context. Dancers from the Dayton Contemporary Dance Company2 will perform in the production, which is March 16-17. Innervisions is choreographed by DCDC Artistic Director Debbie Blunden-Diggs and directed by Fleming. It features musical direction by Deron Bell, media art by Basim Blunt and costumes by Ayn Wood. Both performances will take in the Paul Robeson Cultural and Performing Arts Center on campus. All performances begin at 7:30 p.m. Ticket costs for both productions are by donation at the door. The 2018 Theatre Arts Program is presented by Central State University’s Title III Program in conjunction with the Department of Fine and Performing Arts. Wilberforce, OH – Central State University has been selected to partner with a national project to train students to be informed and engaged citizens. Amanda Antico, executive director of AASCU’s American Democracy Project, said, "Too few young Americans participate in even the most fundamental forms of civic engagement, such as voting. Unequal participation results in unequal representation. These conditions obstruct our ability as a nation to address and resolve complex social and political problems, which is why this initiative is important and necessary. ADP hopes to educate, inspire and prepare college students for a life of active civic engagement in order to cultivate a more vibrant democracy." Nancy Thomas, IDHE Director, said, "Colleges and universities play a critical role in ensuring the health and future of our democracy." WILBERFORCE, OH - Central State University will participate in a statewide effort to increase college completion rates for historically underserved student populations. As part of the University’s focus on completion and retention, it has also created an Undergraduate Student Success Center. The Ohio Department of Higher Education was one of four entities in the country selected to receive a $2.1 million grant from Strong Start to Finish. The organization aims to significantly increase the number and proportion of low-income students, students of color and returning adults who succeed in college math and English and who enter a program of study in their first year of college. “This grant will go a long way in pursuit of those goals while supporting students as they begin their postsecondary journey,” he said. As part of the application process, ODHE reached out to the presidents of 13 of Ohio’s public universities and the state’s 23 community colleges to determine their interest in participating in the grant opportunity. In order to participate, colleges and universities had to agree to develop institutional goals, including specific goals to reduce equity gaps; assemble a campus leadership team; outline the campus’ initiatives related to Strong Start to Finish goals; and develop goals for increasing the percentage of students completing their gateway math and English courses and entering a program of study in their first year. Central State recently created an Undergraduate Student Success Center after expanding resources to focus more heavily on retention. The Center, formerly University College, focuses on holistic student development. The overarching goal of the USSC is to provide academic and social support services to aid the University in increasing its student success rates, said Dr. Gene Moore, Jr., executive director. The Student Success Center added the Office of Retention and three Retention Specialists, who focus on academic persistence, bolstering retention rates and degree completion. The three units housed in the Undergraduate Student Success Center also changed names to remain aligned with the mission of this critical unit. The Office of Academic Advising and Assistance is now the Office of Academic Coaching and Advising (OACA) and has added coaching as a key component. The Learning Skills Center has become The Office of Academic Support and Instructional Services (OASIS). The Office of First Year Experience has become the Office of Retention. The efforts support the University’s Compelling Priority #4, which is Higher Retention Rate. WILBERFORCE, OH. 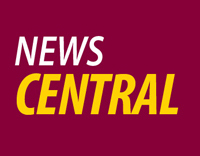 – Central State University will open a satellite office in Trotwood, OH. as part of a partnership with the city to provide educational and community development activities. The partnership, through the University’s Extension Service, will include creating a center focused on community-based educational programming. "With the City of Trotwood being 2/3rds rural as well as the number of alumni who reside in our community, it was only a natural fit that we partner with Central State University to bring agricultural programming to the City," Trotwood Mayor Mary A. McDonald said. 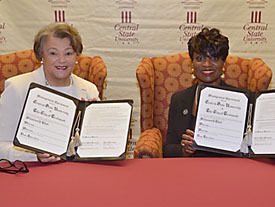 On Jan. 12, Central State President Dr. Cynthia Jackson-Hammond and Mayor Mary McDonald signed the official memorandum of understanding. The agreement gives Central State a presence in northwest Montgomery County. Central State Extension services will be located in the Trotwood Civic and Cultural Arts Center. WILBERFORCE, OH. –Central State University’s economic impact, for fiscal year 2016, on Greene and Montgomery Counties totaled $143.7 million through operational spending, students spending and capital expenditures. The University, a vibrant business enterprise, directly supported 655 jobs and indirectly supported another 341 full-and part-time jobs in the two-county regions, according to Central State’s Economic and Fiscal Impacts report. The report, prepared by the University of Cincinnati Economics Center, is part of an Economic Impact Study commissioned by the Southwestern Ohio Council for Higher Education (SOCHE), to gauge the economic impact of colleges and Universities in the region. SOCHE’s Economic Impact Study shows that the total impact of all 22 member institutions was $7.3 billion in fiscal year 2016. For every dollar spent, approximately 72 cents in additional economic activity occurred. Central State is a collaborative partner with the City of Xenia, the YMCA, Clark State Community College, the Xenia Adult Recreation and Services Center and Kettering Health Network to support the Recreation, Education, Activity, Community and Health (REACH) Center in Xenia. The Center will serve Xenia and Greene County residents' health, workforce, recreation, education and wellness needs. With the main campus in Wilberforce and CSU-Dayton in Montgomery County, Central State’s regional presence offers a variety of educational and workforce opportunities. As a regionally accredited 1890 Land-Grant Institution, Central State University is increasing its presence throughout the state of Ohio with increased emphasis on research and extension services. WILBERFORCE, OH. – The vocal artistry and majesty of a Central State University Chorus performance will now be available to be shared via recording as the Chorus prepares for a live-recording. The world-acclaimed Chorus, which has performed around the world, will bring that sense of excitement and awe to new audiences so that more people in the United States can be exposed to what international audiences have witnessed, said Chorus Director Jeremy Winston. “We want to capture this great musical experience that the choir presents in concert travelling around the world and performing in world-class concert halls,” Winston said. Admission is $2 for students with an ID and $5 for the general public. Winston said the audience can expect to experience the full range of the Chorus’ repertoire - classical, jazz, gospel, spirituals and music from the movies. Backed by a full orchestra, the Chorus will perform its most requested song, “Total Praise,” and songs from well-known movies such as Porgy and Bess, Dreamgirls, Breakfast at Tiffany’s and Ray, Winston said. The Chorus, which is 45 members strong, consists of students representing freshmen through seniors. “We’ve got a lot of new singers and this is a new ensemble but they sound magnificent,” Winston said. The CSU Chorus has performed at The White House for their annual holiday celebration at the invitation of First Lady Michelle Obama and for Ohio Governor John Kasich’s inauguration. In addition, the Chorus has also performed in over a dozen major international cities including Madrid, Barcelona, and Valencia, Spain; Prague, Czech Republic; Durbach, Germany; and Straussburg, France. This is not the first time the Chorus has recorded. In 1993, the Chorus performed with the Cincinnati Pops Orchestra, resulting in the Telarc International CD, A Gospel Celebration, Amen. The disk was nominated for a Grammy Award and also featured Jennifer Holliday, Maureen McGovern, and Lou Rawls. The Chorus was featured on Blue Monday and Porgy and Bess for Telarc and The Cincinnati Pops. Central State University’s 2016 incoming class of new first-time students allowed the University to achieve double-digit growth among new students. New and increased recruitment efforts helped to fuel the growth. This year’s class of 634 first-time students is the largest in the past five years. It represents a 22 percent increase over Fall 2015. The University's projections of new students were also exceeded when new transfer and College Credit Plus students were added. The University is projecting a record incoming class for Fall 2017, as more families understand the value and benefits of a Central State University education.